"A generous and inspiring book! In the spirit of 'convocation,' Nash and Murray call together both university faculty and student affairs professionals to provide them new means for helping more college students realize the highest purpose of higher education—that, in pursuing the means to make a living, one comes to make a meaning worth living for." "Educators across campuses—faculty and administrators alike—will find in this book not only the importance of helping their students construct meaning upon which to base their academic and life ambitions, but also practical suggestions for doing so. Ultimately, those who will benefit most from this book are students whose education inside and outside the classroom is informed by the type of cross-campus, interdisciplinary approach to meaning-making put forth by the authors." 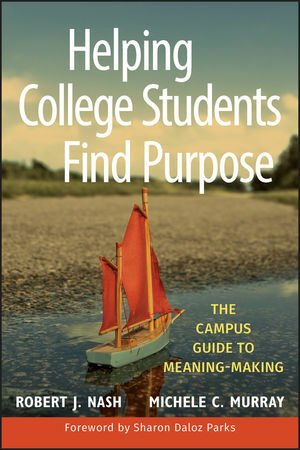 "This comprehensive compendium is a must-read for any higher education professional interested in responding to students' ubiquitous concerns about existential issues concerning purpose and meaning. It brings together classical and contemporary thought, conceptual depth, and concrete suggestions for practice. This scholarship is enriched and enlivened by the authors' personal perspectives and experiences, and by student voices and vignettes. Buy it and keep it handy as a source of wisdom and good counsel." "A thoughtful, provocative, moving, yet practical guide for any teacher seeking to make the college classroom a space for inspiration and hope." Robert J. Nash is an Official University Scholar in the Social Sciences and Humanities at the University of Vermont, Burlington, and has been a professor in the College of Education and Social Services there for forty years. He is the 2009 recipient of the Joseph A. Abruscato Award for Excellence in Research and Scholarship there. A prolific writer, he has published ten books, including How To Talk About Hot Topics on Campus from Jossey-Bass, as well as more than one hundred articles, book chapters, monographs, and book reviews in many of the leading journals in education at all levels. Michele C. Murray is the associate vice president for student development at Seattle University. She provides leadership for engaging students in cocurricular activities that enhance their intellectual, spiritual, and emotional development. In addition, she supervises departments that facilitate student involvement, including New Student and Parent Programs, Leadership Development, Commuter and Transfer Student Services, Office of Multicultural Affairs, and Student Activities. Part I: Making Meaning in the Quarterlife. 1. Is the Quarterlife Generation Ready for Meaning-Making? 2. Exploring the Meaning of Meaning: Existentialism and Postmodernism. 3. Finding Meaning in Religion and Spirituality: Why Can’t My Faith Be Cool? Part II: Putting Meaning-Making to Work: Tools of the Trade. 4. A Pedagogy of Constructivism: Deep-Meaning Learning. 5. Make Room for Meaning: Practical Advice. 6. The Ethics of Meaning-Making. 7. Meaning Maxims for Both Inside and Outside the Classroom. Part III: Our Own Attempts to Make Meaning. 8. Two Personal Reflections for Our Readers. Resource A: Four Therapeutic Approaches to Meaning-Making.